A number of reporters here seem upset. One of their main sources of ire is the security fence around the “Big Top” where the plenary sessions are held. Some press have reported this to be a “10 foot chain link” fence. I guess that sounds more menacing than “security fence.” To set the record straight, I crept out under the cover of darkness to get my photo taken next to said fence. No Photoshop was involved. I am not ten feet tall, though I am about 6′ 6″ tall. 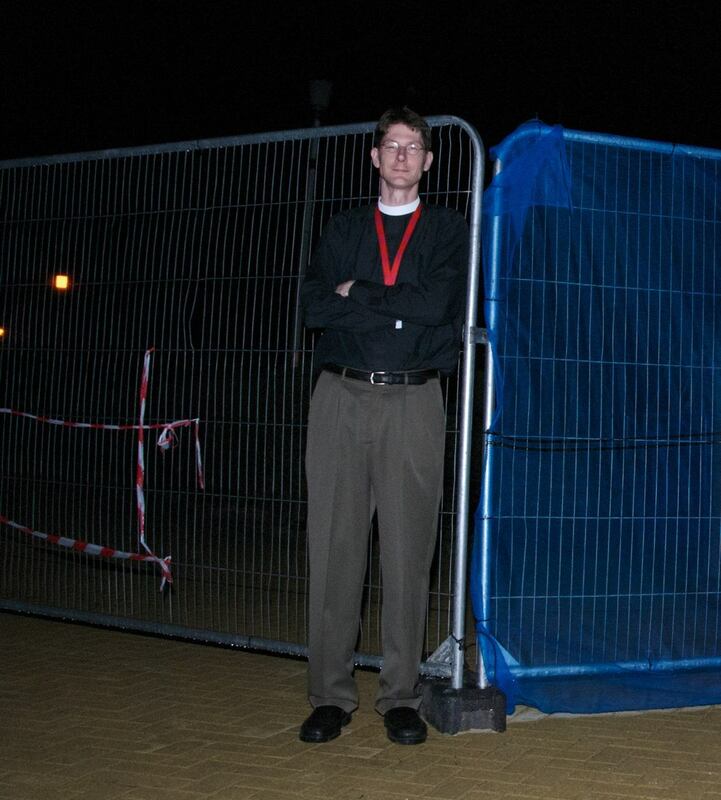 So there I am, standing next to the “10 foot” fence. As you see, it’s not even close to the alleged ten feet. It’s a small thing, but 7WD is here to correct mainstream media when it errs. Those 42 inches of exaggeration are important. Suppose I said that the Anglican Communion has 80 provinces or that the current Pope is Benedict LVIII or that the staff of 7WD consists of 43 people. No one would stand for me just adding 42 to something in order to make a point (even if 42 is the answer to life, the universe, and everything). So let’s get the fence measurements right. It’s two meters (about). Less menacing, but more accurate. Continuing my new-found zeal of investigative sleuthing, I believe I’ll have an update on the “cartoon tent / mystery cage” controversy soon. The latest is that Dave Walker, cagey fellow that he is, has issued a non-denial statement. This almost always means that something lurks behind the facade, and I will have proof of this soon. Check 7WD about every five minutes, if possible, for the next day or so. You will not be disappointed. “Debunking the mainstream media” is a interesting view of Public Relations. Your red lanyard indicates that you are a staff member. so while you are at the conference you can only give a positive spin. Or am I being unfair? Yes, I’m on “staff” as one of the official photographers. Nice job on memorizing the complicated lanyard color scheme! No one has said anything to me about what I can or can’t blog about. There are a number of bishops, staff, and stewards here blogging — and I suspect you’ll find a range of opinion. What I write here is what I choose to write, unfettered by Lambeth Palace or anyone else. My aim on 7WD is to provide a bit of flavor for what it’s like here — and to have a bit of fun. One of the great sins of the church (and of the media, by coincidence) is that we take ourselves far too seriously. Agreed we all take ourselves too seriously. But among the fun, i wonder if you will give a warts and all coverage? A “feed” for most of the blogging bishops is here. Too many of the media representatives on site have been behaving in a less than honorable manner. Swapping cards with unknown individuals, comprmising the safety of the bishops gathered and pretending to ignore -and, when unsucessful, distort the reality of- the organizational devices in place are only a few of what I’d complain about. To put it briefly: some of the media here at Lambeth has become a source of safety concerns for those involved in organizing the conference and therefore entrusted with the safety of those gathered. Shame on them. OMGoodness–the fench looks like a dog kennel!